If you are relatively new to the investing world, you may not have a realistic reference point to understand how painful stock market corrections can be. 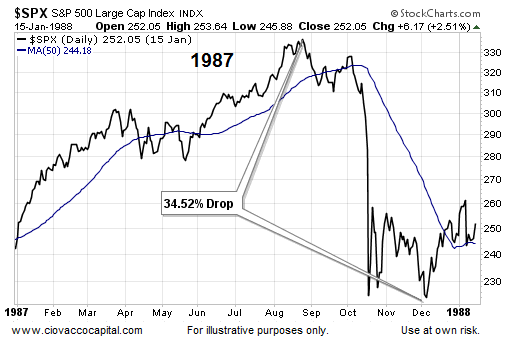 A trip down the memory lane of market corrections (1982-2014) reminds us of what a typical year in the stock market can look like. On the surface, the 2014 stock market is holding up relatively well, but the picture behind the risk-reward curtain is concerning at best. Even if a corrective episode is averted in the short run, it is only a matter of time before the correction-less investment fantasy land comes to a painful end. The S&P 500 closed at 1,833 on December 24, 2013. It closed at the same 1,833 on April 10, 2014, or over three months later. Common economic sense and the law of supply and demand tell us that when stocks stop making bullish progress, bullish economic conviction is losing ground to bearish economic concerns. 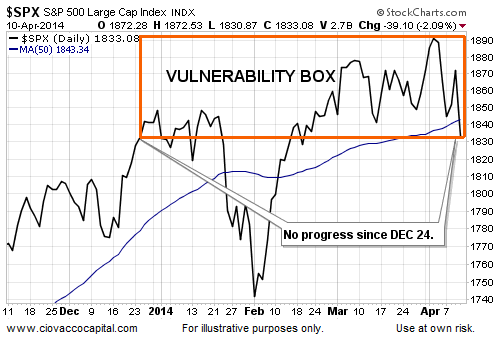 The previous sentence also tells us the market’s risk-reward profile has been deteriorating since late December 2013. JPMorgan Chase reported an 18.5 percent slump in first-quarter earnings on Friday, as the nation’s largest bank grappled with dual challenges: sluggish revenue from trading and lackluster mortgage lending. Both issues, broadly buffeting the banking industry, damped profits at JPMorgan. How far can stocks drop? 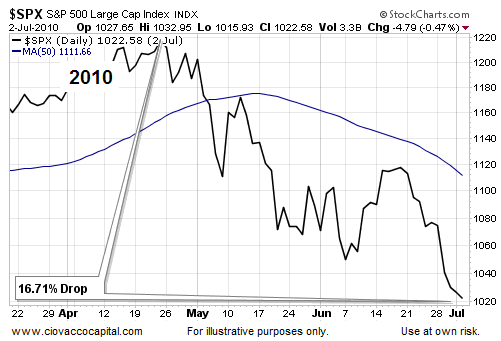 How long can corrections last? 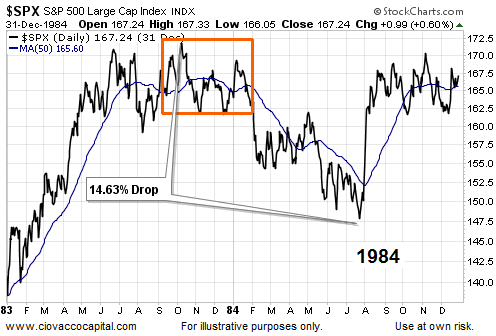 In 1984, stocks dropped 14.63%. Unlike the multiple-day pullbacks in 2013, this correction lasted two hundred and eighty-eight calendar days (288). 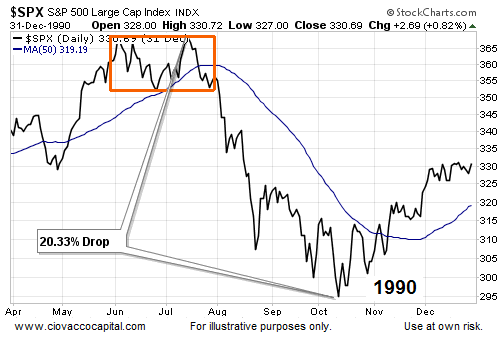 The 1987 stock market crash occurred within the context of a bull market, and the bull market resumed relatively quickly. Therefore, it is relevant to our correction study and 2014. 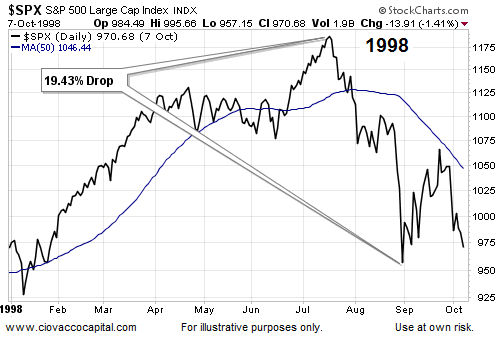 In 1990, stocks corrected sharply, dropping 20% over eighty-seven calendar days. We have covered the importance of the investment landscape in 1994 numerous times, including this March 21 article. In 1998, the correction may have felt like a bear market based on the sharp declines witnessed on brokerage and 401k statements. 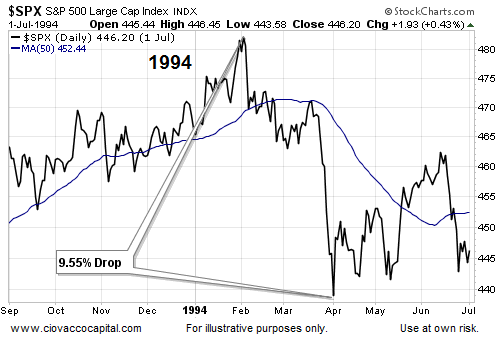 The 1998 correction was outlined in more detail on April 2. The 2010 Flash Crash was quite a bit more than a one-day media event. Stocks dropped 16.71% over sixty-seven calendar days. A political stalemate in Washington and escalating fears of the end of the euro, helped push stocks down over 21% in 2011. 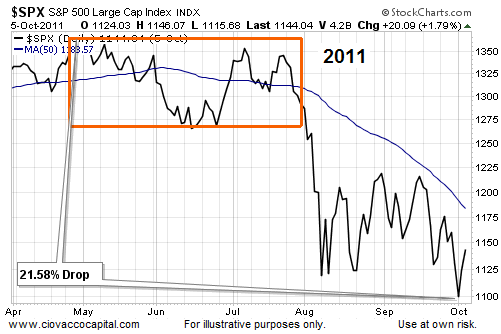 What are the answers to our questions of how far can stocks drop and how long can corrections last? 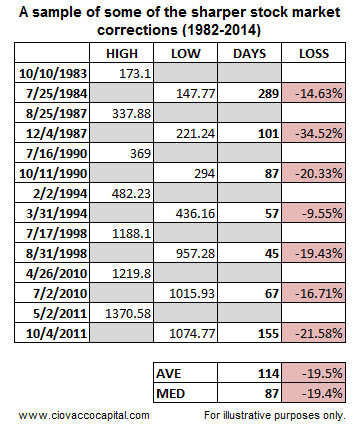 Based on the examples presented above, the average loss was 19.50% and the average duration was 114 calendar days. Can corrections be less painful? Sure, there are countless examples of more shallow pullbacks. However, understanding what is possible helps with investment contingency planning. If the first contingency in your simple risk-management plan was if the S&P 500 closes below 1,815, I will reduce my stock exposure by 10%. The S&P 500 closed Thursday at 1,833. Hypothetically, if the S&P 500 fails to correct and never closes below 1,815, then no action would be taken. The concept of using IF-THEN contingency plans was outlined in detail on October 18. Our contingency plans are governed by our market model. The model entered Friday’s session with a very large allocation to cash to offset the market’s increasingly vulnerable risk-reward profile. Based on how things look at Friday’s close, our rules-based system may call for two chess moves: (a) reduce stock exposure (again), and (b) add some conservative investments to the mix. Conservative investment moves typically involve bonds (TLT) and/or currencies (FXA). As outlined in detail on March 27, contingency planning is a quadrant two activity – important, but not urgent. Weekends are a good time for getting into quadrant two.